“So we are going to go to the middle of Mabu, we are going to the centre of the forest, we are going to see what secrets Mabu has to give up, and we are going to discover new species”. -Professor Julian Bayliss. Check out the first feature article about the project in the Observer, the Guardian UK Sunday edition. 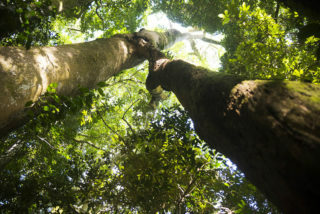 This scientific and educational expedition was the first of its kind ever attempted, penetrating into the heart of the largest rainforest in Southern Africa forest. Our objective? To discover new places on the mountain for future tourism, find new species of plants and animals, create an ethnobotanical report, check on the health of the forest, write a series of feature articles for the press, produce a documentary film about the adventure and create a 3d Map to deliver the Mabu360 Virtual Reality Experience. The expedition successfully uncovered new waterfalls, eden-like campsites, new valleys of giant trees, and even more new species. Media partners are currently being sought for worldwide distribution of both the film, footage, writing, imagery and the 360 VR film experience that lets everyone explore the mountain’s research, riches and discoveries using a new 3D map and immersive 360 video. See below for more about this exciting way to use technology to help preserve the Mabu Forest. The team is also producing a teaching syllabus about the science of Mabu for secondary schools in Mozambique and around the world. 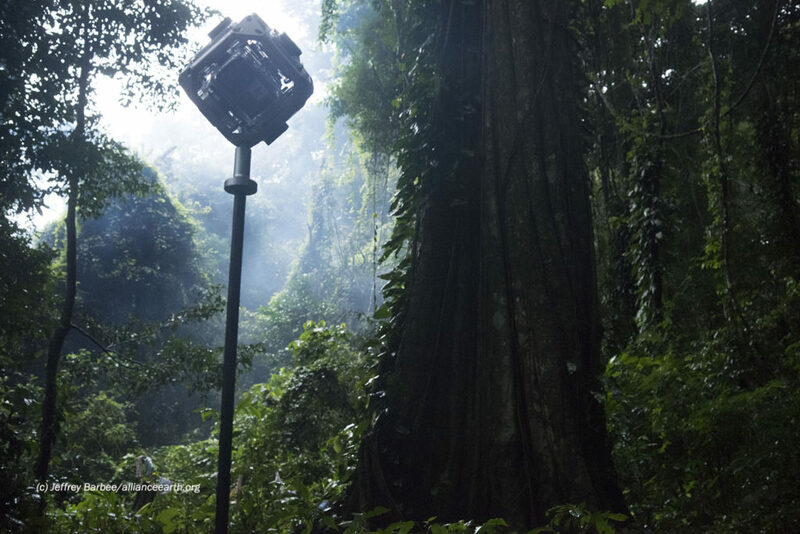 Using the latest technology Alliance Earth filmed a unique 360 degree virtual reality project based on 3d mapping technology for museums and science centers around the world, so that everyone can join the expedition and experience the mountain’s mysteries first hand. Get in touch with AE Director Jeffrey Barbee if you would like to find out how we can bring a photography exhibition, the immersive Mabu360 Experience, a film screening and a talk to your museum, university, secondary school or science centre. Check out some of the images below. If you would like to see a larger selection for your publication, email us here. Smoke rises from a cooking fire at basecamp, before the team departs for the heart of the forest. 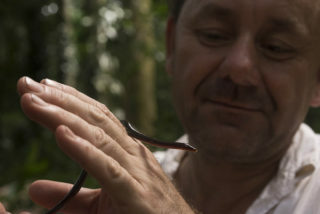 Dale Millard holds a rare snake, discovered here on Mabu and still awaiting scientific description. The team leaves the summit for the forest once again. 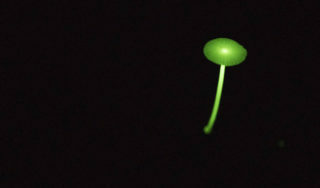 Never before photographed bioluminescent mushrooms dot the forest floor in the rainy season. 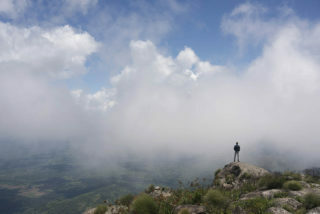 Expedition medical doctor Roland Van De Ven takes a break from the forest to enjoy the view from the top of the mountain. 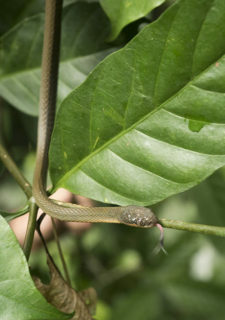 Hunting in the lower growth of plants about chest-high this yet to be named new species of snake on Mount Mabu probably preys upon the Pygmy Chameleons. Ernesto Andre, 38, Ofelio Cavalleo, 41, Bartolomeu Ofelio, 26, and Lopes Andre, 46 knew all about the mountain long beofre Julian and his team arrived. They grew up there, hiding from the civil war with their parents. Today they live on the forest edge and their way of life is changing. As they move from hunting to guiding, they hope to take more visitors into their former home, and share the magic of their mountain with the world. 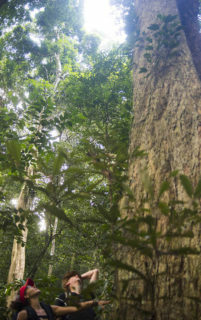 In a new part of the forest to science Dr. Roland Van De Ven and sustainable forest products expert Ana Alecia Lyman look up into what the team called the Hall of Giants, after the incredible size of the trees here. Big trees in the Valley, or Hall of Giants. 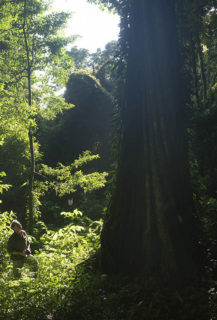 Prof. Julian Bayliss and Alliance Earth Director Jeffrey Barbee return with a team to the Mountain to finally journey into the heart of the forest. 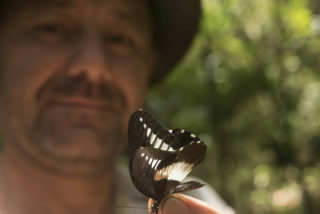 Remarking about this “possible” new species Prof. Bayliss holds out another butterfly catch near the centre of the Mabu Forest. Cleaning and fixing feet and clothing after five days deep the in the forest the team tries to dry out with a fire. Left to right: Phillip Jordaan, Prof Julian Bayliss, Bartholomew Ofelio, Ofelio Cavaliao. 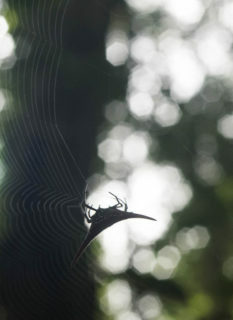 A crab spider spins a new web every day, from every bush tree and vine. The webs are everywhere, and although they are persistent and fearsome looking they are harmless to large prey like humans. 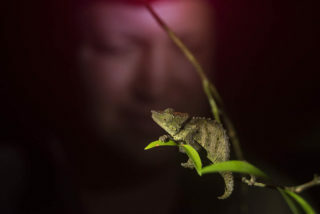 A new species to science discovered on an earlier expedition led by Bayliss, the Mabu Pygmy Chameleon Rhampholeon maspictus is watched by herpetologist Phillip Jordaan deep the in the forest. 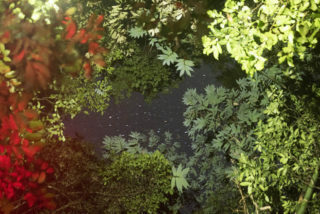 A rare glimpse of the stars through a gap in the canopy a 100 meters away is framed by the coloured headlamps of the expedition team on the tree leaves while they sit around the campfire. Red headlamps help to keep night flying insects away from sensitive faces. 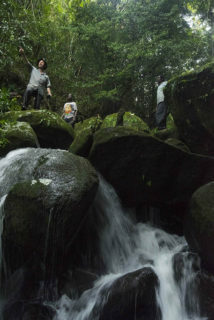 Standing atop an unknown waterfall Dr. Bayliss is pointing out the lowland Miombo forest to guides and brothers Ernesto Andre, 38 and Lopes Andre, 46. It was arare to see any break in the canopy and this was the first view the team had of anything other than trees in two days. 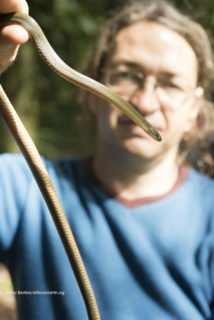 Professor Julian Bayliss holds an extremely rare reptile, very possibly a new species, evidently halfway between a blind snake and a lizard. The creature lives below the leaf litter, but emerges out onto the forest floor during heavy rain where the researchers discovered it. 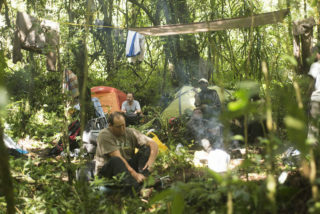 Professor Julian Bayliss at Forest Camp on the edge of the mount Mabu Forest. Discovered in the mid 2000s, Mount Mabu is home to dozens of new species, most of them found along it’s periphery. 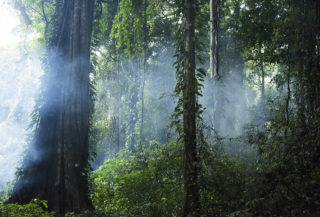 Prof. Julian Bayliss and Alliance Earth Director Jeffrey Barbee return with a team to the Mountain to finally journey into the heart of the forest. Dr. Roland Van De Ven, Clemmie Borgstein, Phillip Jordaan, Dale Millard, Jeffrey Barbee, Julian Bayliss, Ernesto Andre, Hassam Patel, Ana Alecia Lyman, Ofelio Cavalleo, Bartolomeu Ofelio, and Lopes Andre. This entry was posted in Editorial, Environment, Featured Articles, Science. Bookmark the permalink. as all new discoveries are so special so is the fascinating research work that tou are conducting – love to be there with you !! Dear Jeff Barbee, My name is Ana Mariguêsa and I work for the European Union office in Mozambique. I saw your article about Moiunt Meru on the Guardiamn Newspaper and I would very much appreciatte you to enter in contact with me. 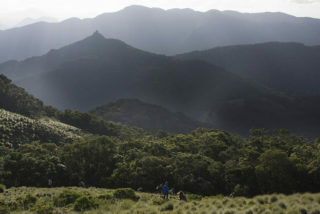 We are at this stage looking at possble support for the hotspot of Biodiversity, Mount Meru. 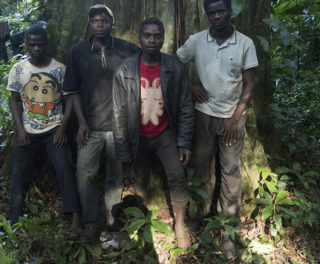 Just saw Bayliss awesome tv feature og Mabu forest and new species, an ultimate dream for biologists. I finished zoology and then proceeded to medicine and everytime I learn of adventures like yours, I wish I can be there with all the surprises. More power to your team!